Recent announcement from D23, the officially-sanctioned Disney fan club: Following the success of the first 5-issue miniseries (and the subsequent graphic novel compilation), Figment will return this fall in a brand-new full-color series from Marvel. 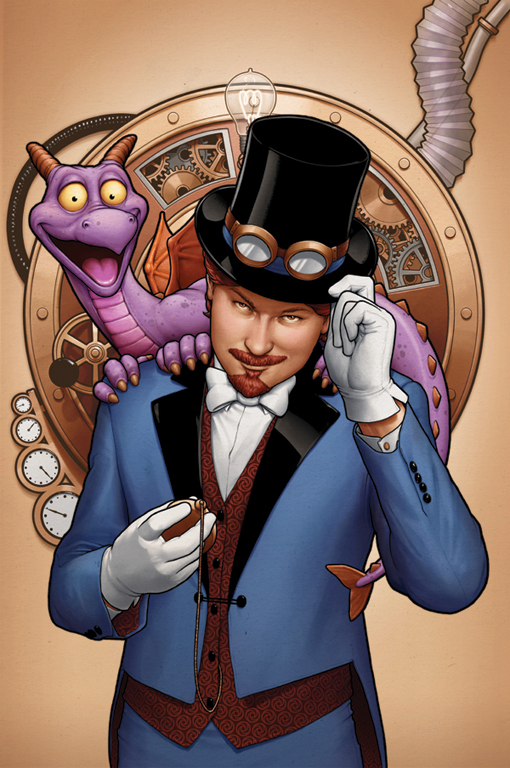 “Figment 2 will be written by Jim Zubkavich (aka “Jim Zub”) and penciled by Ramon Bachs, and it’ll pick up where the first series left off—but in a totally different time period. When last we left our intrepid hero Figment and his pal Dreamfinder, they’d saved the world and were awarded for their good deeds by being stuck out of time for a century. As Jim Zub explained to our pals at the Disney Parks Blog, ‘[The pair is] now in the modern world, and they’re going to discover that a lot of things have changed in their absence… Couple that with a young dreamer inspired by the Academy Scientifica-Lucidus and a dark threat from an unexpected source, and we’ve got all the ingredients for high adventure’.” Check out D23 for more information.